If you work from home, you understand the constant struggle between focusing on your business and taking care of the home. Unfortunately for a lot of us, our inability to manage all our roles simultaneously can lead to one part of our lives suffering from neglect. How can we remain productive in our jobs, while maintaining harmony in all other things we need to do? “How do you cope with writing, taking care of the kids and having time for yourself?” This is a question that I get every single time I introduce myself to anyone as a full-time writer and mom, who works from home, with two toddlers. I’m sure that anyone, especially mothers who work from home are familiar with these type of questions. Alhamdulillah, there are now more jobs that allow mothers to earn a living from the comfort of their homes while taking care of their children. But working from home, with children underfoot, is not an excuse to not be productive, or slack on the business front. As Muslims, there should be excellence in the way we live our lives, and this extends to how we work with clients, run our business and take care of our home. Additionally, lack of productivity means that our home businesses probably wouldn’t see much success! So, how is it that I balance my job and my home life? Well, it isn’t easy! Upon reflection, the following are key ingredients to successfully manage both my children and my work. It’s amazing how we can sometimes skip the obvious. Consider this scenario: when racing to meet a deadline, one of your children just spilled her freshly-made lunch on the newly-cleaned rug, and another is leaving a trail of torn craft papers all over the living room. Your first instinct may be to completely lose your temper. Before you do, have you asked Allah to ease your affairs? When Fatimah complained to the Prophet Muhammad about her hands blistered from work and requested that he provide her with a maid, he advised her to remember Allah instead. 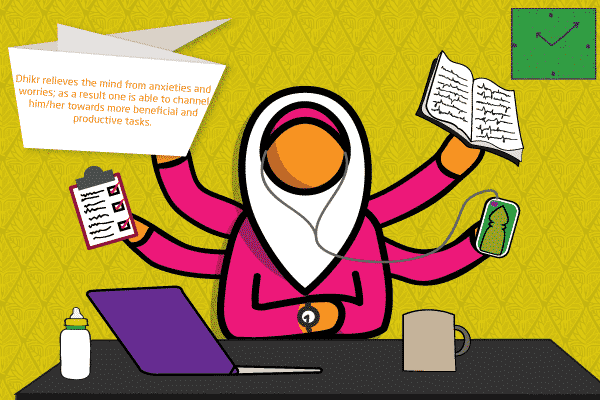 The first step towards productively working from home while raising children is to ask Allah to ease your affairs. Nothing is too insignificant to be put in prayers, and when your dua gets answered, you find that it becomes easier for you fulfill your duties as a mother and businesswoman simultaneously without one affecting the other or becoming overwhelming for you. One of the most productive habits I’ve cultivated in my work-from-home journey is organizing the house. Not necessarily cleaning the house top to bottom, but routinely tidying up the house to keep things easy to find, and out of the reach of little fingers. I would normally divide things in the house into different categories. For example, most of our possessions can be divided into things used often and not so often. The stuff that is rarely used is placed in storage, where the kids can’t get into. This can be the topmost parts of the closet, shelves with locks, or any place that only an adult can reach. Items that we use daily are then stored in easily accessible locations. Kids love exploring and playing with everything except their own toys. So, to reduce how much clean-up you have to do every day, take most things away from their reach. If something is lying around the house, it’s either a toy, a safe object they can play with and put away themselves, or something you need to use that day. The less tidying up you have to do every day, the more time you are able to devote to your business, to your family and to yourself. An organized home can be mentally liberating, a cluttered home can often cause stress and anxiety. Being a mom and a businesswoman means juggling several duties in a day. I don’t know what I’d do without proper scheduling of my tasks. Planning what to do and when to do it, before you start your day, helps me have a direction and a focus towards my duties. My most productive days are the days that I have my tasks planned ahead. To achieve this, I like to plan my tasks around the five daily salah. I use them as milestones for all my tasks. So in a typical scenario, the day will start with the fajr prayers, then breakfast, school runs, and all writing tasks will happen before dhuhr. Between dhuhr and ‘asr is the time for the kids to get back from school and, I know there will be no quiet time for me to focus on my work except if they nap. This time is the best for tasks that do not require undivided attention. The rest of the day after asr prayers will be devoted to sorting out homework, chores, meals and play time with the kids. Your schedule will be different to accommodate your family’s needs, but the most important thing is that you put a structure in place to help you organize your day before it begins. Planning your day around salah also helps you keep up your spiritual focus. This has been one of the most significant productivity changes that I made when I started working from home. I put the kids on a schedule that fits into my own overall schedule. The biggest one was having a fixed sleep time every day. I can be flexible on nap times, but everyone has to go to bed at a particular time every night. This is crucial for my own mental well-being! A mom/business owner is at the risk of burning out if she doesn’t give herself personal time to relax. I use the time after the kids have gone to bed, to relax, plan my tasks for the next day, or do some reading. Not pizza or Chinese takeout! Regular healthy meals for the family that have been planned in advance are a lifesaver. I cook at least three meals from scratch every day, and the only way that we can cut down on cooking time when we cook from scratch is by planning our meals in advance. You may or may not have a food timetable. But all ingredients that we need for most meals are stocked during the weekends, and sauces and soups are usually made in advance and frozen. And, even though I don’t make strict food timetables, part of my daily scheduling includes mentally thinking about what to cook the next day, if Allah wills. By stocking the pantry with the necessary ingredients, and freezing others, we can significantly reduce the time we spend in the kitchen. And, this saved time can be productively used for other tasks, or to work on our business. Sometimes, we are not able to handle everything on our own, and it is perfectly fine to outsource whatever we can. There are aspects of running a business, like accounting, that can be outsourced to a competent freelancer, or you could hire a housekeeper to help you keep your home organized. Women are often called “superhuman”. While this may sound endearing, in the long term, it is not practical or healthy for you, or your family. You should never feel guilty for asking for help – you know yourself and your family best, so consider outsourcing to make your life easier. I spend a lot of time in one spot, typing away at the computer. This has not been good for my health and it took a long time to realise that it was the cause of the constant lethargy that I felt. Exercise and healthy eating is important to productivity. The body needs to be healthy so that you can accomplish all that you set out to do in a day. Your choice of food can also impact heavily on how productive you are in a day. Eat healthy meals that will boost your brain power and give you long lasting energy instead of depending on coffee and lots of sugar. Exercise can be as simple as taking your children for a walk to the local park, or asking your spouse to take care of the children while you make time for the gym a few times a week. Taking care of yourself will ultimately manifest during your duties as a mother and businesswoman. This is perhaps one of the most important tips that I could give you; sometimes things won’t go according to your carefully-laid plan; sometimes your meals won’t be ready in advance, and sometimes you might not feel like waking up really early – but that’s okay! We have to accept that on some days, all of our tasks won’t be sorted, and we won’t always be at our most productive. But the benefit of working from home, is the ability to step back and recharge yourself when you feel mentally or physically exhausted. On these days, tell yourself that it is perfectly fine to take a break, and reconnect by spending time with your children, going on a date night with your spouse, or just spending time with yourself and Allah . When you feel re-energized, say Bismillah and begin again. Did you find these tips useful? What advice would you give to parents who work from home? Share your comments below! Freelance writer Amina Oke has an undergraduate degree in the English Language from the University of Ilorin, Nigeria, and a Masters’ degree in International Relations from the University of Birmingham, UK.